Trampoline Accidents: Who is Liable? Head and neck injuries (which can lead to permanent paralysis and death). Unfortunately, homeowners are almost always held accountable for trampoline related injuries. Landing on the frame or springs. In most instances, trampoline accidents occur through no fault of the homeowner. However, they can still be held liable, which is why most Miami personal injury lawyers would recommend against purchasing one. Despite the circumstances leading to a person or child’s trampoline related injury, a homeowner is generally held liable because they had a “duty of care.” According to State law, homeowners have a legal duty to exercise appropriate care when it comes to the safety of those that enter or visit their property. If a homeowner does not exercise reasonable care, they may be deemed negligent, thereby opening themselves up to a lawsuit. When it comes to a recreational trampoline, a homeowner has a duty to take reasonable steps to ensure that the trampoline is in good working order and that it is being properly used. This means ensuring that only one person uses the equipment at a time, and that they are not behaving in a reckless manner. While this may seem unfair, it is a responsibility a homeowner must accept if they choose to invest in a trampoline and invite people to use it. 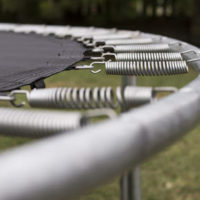 In Florida, a homeowner may still be held responsible for a person’s injury even if they took reasonable precautions to prevent a trampoline injury. This is due to the “attractive nuisance” clause, which basically states that a homeowner’s duty is heightened in order to protect children from harming themselves on an “attractive nuisance,” which can include but is not limited to a swimming pool, a swing set, and a trampoline. This holds true even when a child is technically trespassing. If you are thinking about investing in a trampoline in Florida, consult with a Miami personal injury lawyer before doing so. The team at Spencer Morgan Law can advise you on what precautions to take to prevent any legal disputes, and to keep users safe. To speak with a member of our team, call us at 305-423-3800 today.